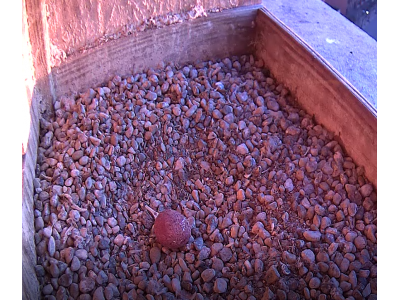 The first egg arrived early in the morning on 3/16/2018. This is three days earlier than the last two years. Rebecca started incubating the egg right away. She must have some sense of the temperature and know when the egg needs warmth. Kewpee has taken a couple of short stints at incubation. Kewpee has a challenging time settling down on the egg and usually calls for Rebecca to come back quickly. There is a video clip from the morning on 3/16 of Kewpee with the first egg and another clip of Kewpee (a few minutes later) calling for Rebecca because he is ready to leave.